Three artists explore the archetypes of painting as a form of abstraction by reconstructing existing materials to newer ends and semblances, through the re-contextualization and refocusing of everyday objects into beatific cultural signs, and the ontological recording of experience and visual phenomena into dialogues of surface design: as painting. 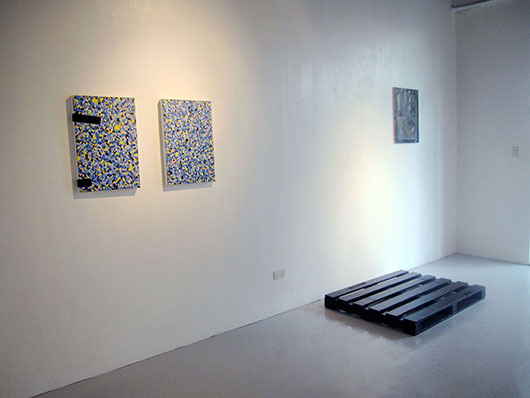 Taking his inspiration from the makeshift furniture made in construction sites, the fundamental value of which consists of the constant alteration of form and function, itself a drawing analogy, Poklong Anading recreates the mutable object into a commentary about the absorbing and refractive quality of painting, having the ability to represent as needed albeit always ambling towards a condition of the unknown. In similar fashion, working from found material on site, Jon Cuyson reframes our reading of the abject, passed over as everyday discard into objects of visual arrest, as intellectual puzzles that fool the eye into seeing beauty sourced from absolutely nothing, which turns into a critique on art and the hierarchy of taste. Dominic Mangila makes non-objective renditions of the world using combinations of earthy tones and hues along with textured gestural spreads that give an impression of still life yet vibrant with new meaning.